Microsemi Corporation today announced the production release of its new Smart Storage SAS/SATA adapters. The addition of these advanced Smart Storage adapters advances Microsemi’s Smart Storage offering for SAS/SATA server storage in data centers with full board-level solutions as well as silicon plus software for custom embedded solutions. The entire product portfolio, which includes the Microsemi Adaptec HBA 1100 family, SmartHBA 2100 family and SmartRAID 3100 family, is based on the company’s latest 28nm SmartIOC 2100 and SmartROC 3100 storage controller integrated circuits (ICs), and delivers high performance, low power, reliability and feature-rich solutions tailored to a variety of server storage applications, including software-defined storage (SDS), cold storage and enterprise applications. The HBA 1100 delivers performance and flexibility for SDS applications. The SmartHBA 2100 is a unique adapter solution which delivers all the benefits of an HBA 1100 plus the option of basic hardware RAID on a selection of drives, ideal for SDS applications with the desire for RAID for boot drives or small/medium business (SMB) applications. The SmartRAID 3100 offers maximum functionality, acceleration through caching and the highest data availability for the most demanding enterprise storage applications. Each of the three solutions offers port densities up to 24 ports in half-length, half-height form factors, and come in a variety of port configurations. Microsemi’s Smart Storage solutions can be used in any server storage application with 12 Gbps SAS or 6 Gbps SATA hard disk drives (HDDs) or solid state drives (SSDs). SAS/SATA HDDs and SSDs are forecasted by market research firm IDC to represent 80 percent of all enterprise drives shipped on an annual basis through the end of the decade. Microsemi’s Smart Storage solutions are performance-optimized around SSD performance and power-optimized for HDD-based cold storage. Features are available for both deployment extremes in addition to a myriad of hybrid SSD/HDD applications. 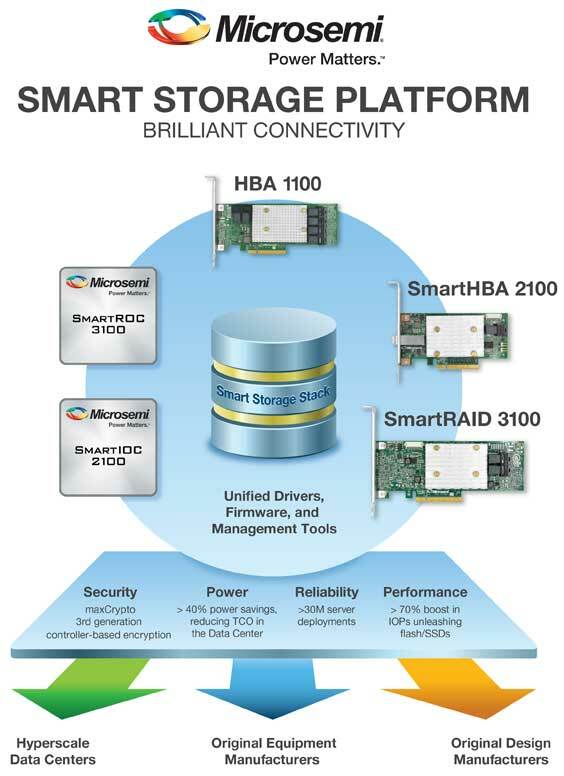 The Microsemi Adaptec HBA 1100, SmartHBA 2100 and SmartRAID 3100 all leverage the unified Smart Storage Stack. Each family has unique differentiating features. The combination of the company’s Unified Smart Storage Stack, SmartRAID and SmartHBA, HBA product families and Microsemi’s SXP family of SAS expanders provide a complete server solution for storage management and connectivity.